We weren't going to get into this topic yet, but we received some pictures from Philips, so we don't want them to go to waste so we'll start talking about flip-chip now! Flip-chip refers to semiconductors that are mounted with the active side down. "Normal" microwave modules use face-up microstrip chips (MMICs). The DC and RF interconnects are made using bumps instead of wirebonds. One advantage of flip chip are that the chips are usually thicker than conventional microstrip, often 25 mils thick. This is a good thing for several reasons: backside processing, usually 25% of MMIC process cost, is eliminated. Thicker die are more rugged and easier to handle. Another feature of flip-chip technology is that it eliminates wire-bonding. Depending on your background, this can be a good thing or a bad thing. If you have invested $100M in wirebonding equipment, you might think of eliminating wirebonds as a bad career move. If you have nothing invested, flip-chip is surely worth a look. This is going to be especially true for commercial work at millimeterwave frequencies. At higher frequencies, wire bonds can add a randomly-variable inductance at each RF input or output; as you go up in frequency, eventually you will hit a point where it may not be possible to compensate for this. The process in which flip-chips are attached to substrates is called die-bonding. Unlike wirebonding, usually, automated equipment is required to perform die-bond. In order to assure good alignment, often a two-camera vision system is used to index the pads on the chip to the substrate. Alignment is critical to RF interconnect performance, but the best equipment of today can routinely align chips to better than five microns. Compare that to 15 years ago, when we were arguing with assembly goons over whether five mils tolerance was good enough! There are several disadvantages of flip-chip technology compared to face-up microstrip. The biggest obstacle is heat removal, when your amplifier is suspended over a substrate on metal bumps that act as "thermal stand-offs". This is only an issue of you are in the power amp business. Another disadvantage worth mentioning is that you will have less accurate circuit models when CPW is used to replace microstrip. If you are serious about CPW/flip-chip, consider Co-wazzit software. Perhaps the biggest proponents of applying flip-chip to millimeterwave are European and Japanese companies. For info we recommend looking at the web site of the Ferdinand-Braun-Institut fur Hochfrequenztechnik. Fujitsu has also done some impressive work up to 110 GHz. Here is a great paper on the technology from Ericsson. Microwave flip-chip can be divided into two categories. MMICs with coplanar-waveguide transmission line structures, and discrete active devices. A third category is inverted microstrip, but this is pretty obscure. CPW is the transmission-line technology invented by CP Wen. 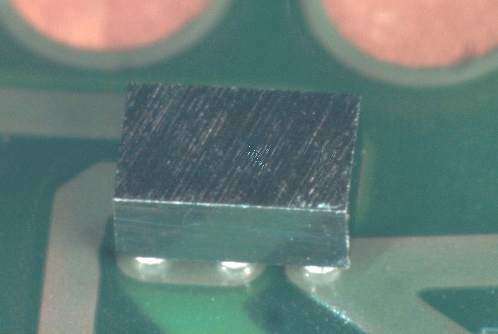 Below is an image of a flip-chip contributed by an employee of Philips.